This tower has won First Place in the Hirst Arts Design Derby 4, Unique Category at the VoidGamers.com site. For those who enjoy dice towers (for example, basswood, laser etched, or round medieval), it is time once again to show the design, construction, and painting of a miniature tower made with plaster blocks cast from Hirst Arts silicone molds. 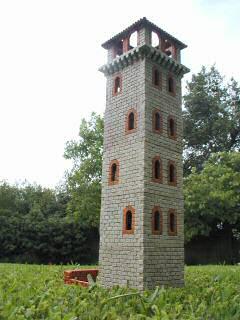 The model shown in the photo is a six story dice tower standing nearly 20 inches (50 cm) high. That's a 15mm horseman standing in the doorway. The tower is painted with latex and acrylic paints and protected with a clear matte finish. What is a dice tower? It is a structure designed to roll dice such that the dice are properly randomized. It eliminates the possibility that a player can cheat on their rolls. Additionally, it serves as a focal point where all players know to look and gather dice for the next roll. However, like many functional objects, one can go beyond mere utility into the world of beauty and art. 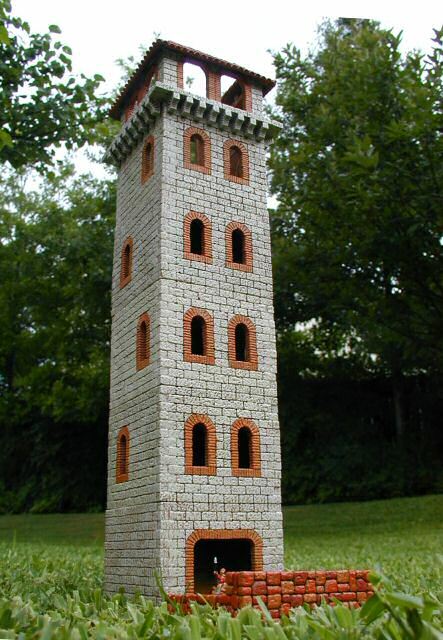 This dice tower is made to look like an Italian bell tower from the 14th century - a campanile . These tall towers were often made of brick, with square bodies, multiple windows, terraced or open floors plans to allow the sounds of the bells to escape, and topped with red terra cotta tile roofs. Famous campaniles include the Leaning Tower of Pisa Torre Pendete , the Campanile of San Marco in Venice, and the Campanile by Giotto in Florence. Today, many American universities have campanile style bell towers as focal points of the campus such as Sather Tower at the University of California at Berkeley and the Memorial Carillion at Iowa State University. My first awareness of the word campanile came from the 1996 Blatz card game Campanile by Hanno and Willfried Kuhn. In this game, players construct the towers by placing one card per turn on one of five towers. Additionally, betting chips are placed at the base of the tower. At the game end the betting chips are scored based on the heights of the tower. I was struck by the beauty of the artwork by Franz Vohwinkel and the unique architectural styles of the five towers. The game, now out of print, is fun as well, and I think it captures the flavor of Italian villages building ever higher towers to boast the wealth and beauty of their town. The only drawback to the game is that it uses no dice or dice towers. As with my round medieval dice tower, this tower is also made with plaster-cast bricks made from Hirst Arts Fantasy Architecture molds. This tower is made from just two molds, the small brick mold (#250) and the clay tile roof mold (#230). Once purchased, the molds can be filled again and again with plaster to make as many bricks necessary to make any sort of building. This photo shows the initial layout of one of the two windowed walls. Each window consists of two arches and 6 other decorative bricks to form the outline of the window. The photo also shows two bricks in each window to maintain the window brick spacing. Then regular bricks from the mold are placed to put three rows of bricks above and below each window. Similarly, one and a half bricks are placed between the windows and on the left and right side of the windows to provide the vertical spacing. The edges of the wall are left with an interlocking pattern so that each wall will mate with the other perpendicular walls of that floor. 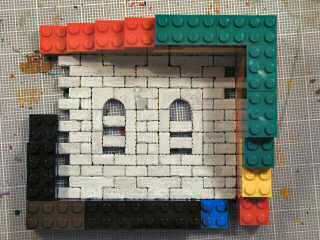 Walls made of Lego bricks help square the walls and make sure they are compact and straight. The plaster is a special type similar to the material that dentists use to cast tooth impressions. 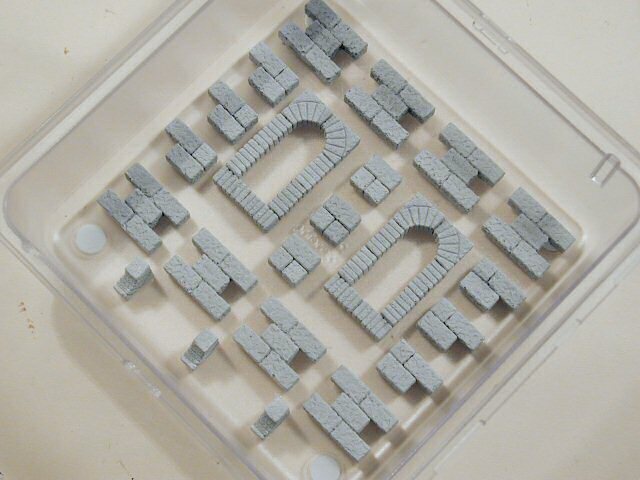 The brand is Excalibur Castle Stone which I ordered from Game Plan Games for about $38 for a 25 pound box. This should last for many projects. Although the Hirst Arts Site has many hints for casting bubble free blocks, I will admit that I am not the best brick caster. The Hirst site recommends pre-wetting the molds and then scraping the excess after 6 minutes. I take a short cut and add a few drops of Jet Dry brand detergent to my plaster water to help break the water surface tension. I also scrap the excess plaster immediately in order to save time. Yes, my technique is not as high quality, but I don't think it is very noticeable on larger projects such as this. After just one wall, I realized this project was going to use a lot of bricks. In order to help with the construction time, I decided to make my own mold of important subassemblies. This photo shows several new shapes to speed the assembly of my campaniles dice tower. First of all, there are two complete window assemblies. Then there are some square assemblies of one full brick and two half bricks to fill in the center gaps. On the left and right sides are mirror images of a three brick assembly (two full bricks and one half) to help with the interlocking wall edges. Above and below the windows are some five brick assemblies to help fill in the top and bottom of the wall. 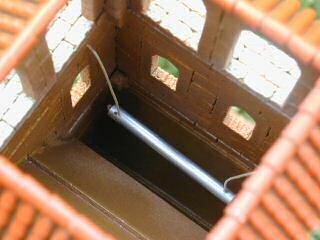 And finally, the bottom has three decorative arches to help with the ornate top floor of the tower. The idea is that one casting of this mold with a few spare bricks would make a complete wall piece. These pieces are glued into a mold form made from a 89 cent clear plastic tray from the Container Store. They come in all sizes and are meant to help organize your kitchen cutlery drawer. This photo shows my mold with a fresh pouring of plaster. 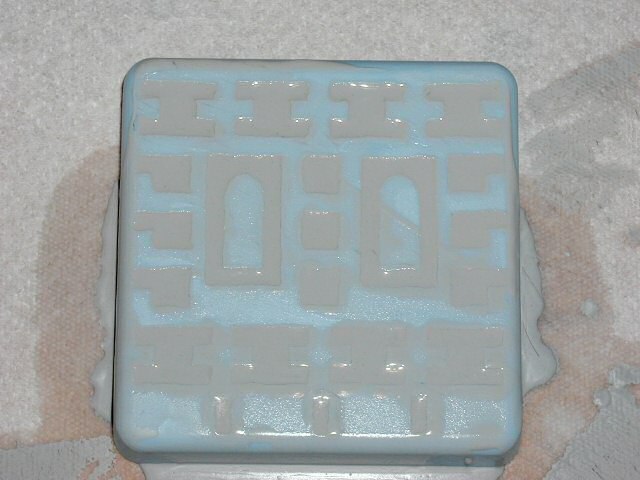 The mold is made from high strength silicone rubber from MicroMark. Don't get the flimsy one to one silicone, as I've used this before and it tears easily after a few castings. The high strength 10 to 1 mixing silicone is better. My mold is brand-new looking after about 20 castings and should be good for about 100 castings. However the material is not as strong and seems like it will tear long before a Hirst Arts mold. Additionally, the Hirst molds seems to be a little slicker and cleans up more easily with water. In this photo, I've already scraped the excess plaster off this pouring with a 3 inch (7 cm) spatula. The little bit of excess plaster is brittle and will break away from the pieces easily. I will harvest a new set of bricks in about 30 minutes. This photo shows a few nearly completed floors of the campanile. You can see that each floor is nearly a cube. There is a bass wood ramp in each floor to help toss the dice. The ramp is glued at an angle of about 60 degrees up from horizontal and is situated such that it crosses no windows. The side walls of the floors only have one window and the diagonal of the ramp crosses the part of the wall with no window. Additionally the four corners of the top of each floor has a brick to help mate the floor with the one above. These key bricks are slightly out of focus here. Since the cross section of this campanile dice tower is square, you can rotate each floor to have the ramps point in different directions. You can have the ramps all point back to front, or alternate, or point in a death spiral. I have noticed no additional randomizing effect from different combinations. 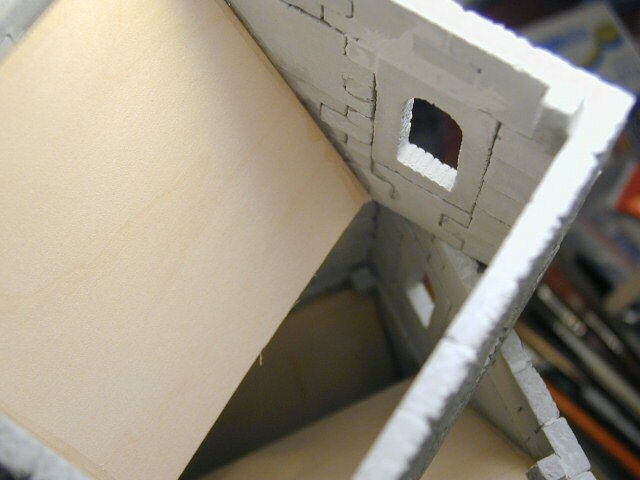 This photo details the campanile decorative top floor and roof. The top floor starts with a open square of bricks three rows deep. This square terrace is visible at the bottom of the photo. The square is supported by 32 decorative arches, 8 for each wall of the campanile. 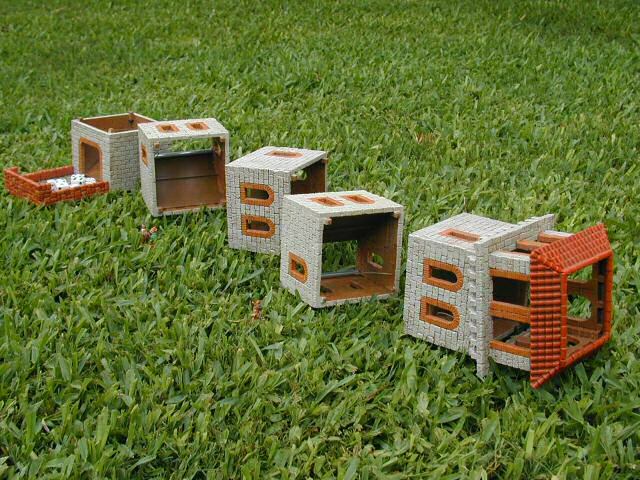 Together the floor and decorative arches allow the decorative top to mate with any of the five cubic dice tower floors. On top of the terrace floor, there are 4 corner posts, each post being two bricks square and 9 bricks high. Between the square corner posts, decorative bricks form two arches so that there are two top arches visible from each side of the campanile, much like a loggia (decorative and airy hallway) seen in many Mediterranean buildings. Topping the arches are the clay tile roof bricks, Normally, a campanile roof, or any Renaissance tower roof, culminates in a point. However, here the point is truncated to leave an opening for the dice to enter the top of the tower. 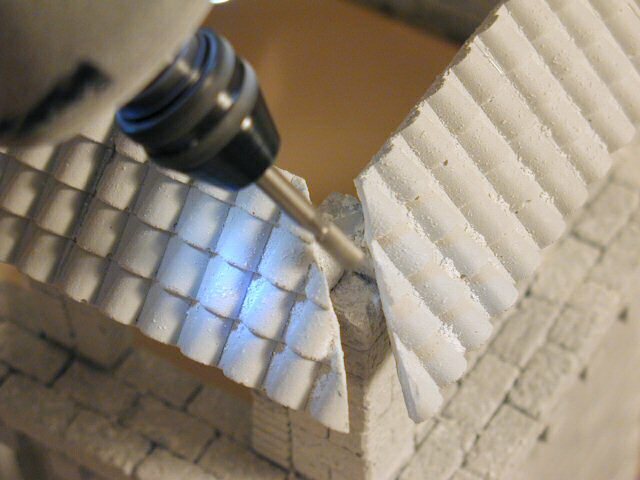 As shown in the picture, sometimes it takes a Dremel rotary tool to shape the tiles to receive the barrel tile corner pieces. 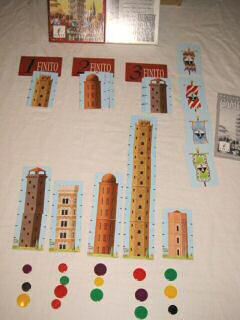 This photo shows all the completed pieces of the campanile dice tower. I've followed the fieldstone painting instructions given on the Hirst Arts site consisting of three layers: a dark brown undercoat, a pumpkin colored medium brown middle coat, and a light beige highlight coat. Additionally, the clay tile roof is painted an orangy-red terra cotta color and the decorative window bricks are an orangy brown. The paint colors were derived from paint sample chips from Bruce Hirst. I brought these to Home Depot hardware store where they scanned the colors and mixed up a quart each of Behr interior latex paints - much cheaper than Vallejo, Citadel, or any hobby acrylic. I wish the highlight color were a bit more limestone looking. Namely I wish the highlight had more yellow to it as I've seen Italian limestone often have. However, perhaps the scanner at Home Depot is slightly off. For the next building, I will mix my own limestone color. 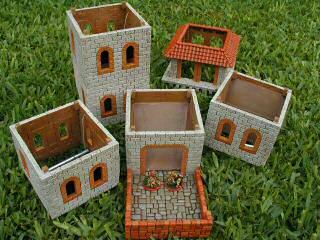 Also, notice the dice tower tray made with some flagstone floor tile bricks (mold #260). I've painted each flagstone a slightly different shade to give it some variation. As you see in the photo, each bell is a small steel bar that has been cut to length and suspended from its end. During the design phase I considered small round bells, but I could not find a miniature tuned set. Additionally, I had to come up with a bell that could easily be struck by cascading dice without trapping any dice against the walls of the tower. I initially purchased a child's xylophone with steel bars, but these did not produce a good sound when cut to fit the tower. Finally, with a two hour visit to a wind chime store I selected a set that rung nicely. Look for copper or steel and not aluminum bells. These bars were suspended from scale ropes that allowed the bells to ring and swing without trapping any dice. And now you get to hear the ringing of the tiny bells! Click on the links to hear an recording of the dice in MP3 format. Unfortunately, the tiny bells are nearly drowned out by the percussive sound of the wooden ramps. It does not matter to me. I enjoy the cacophony of using this wonderful tower. 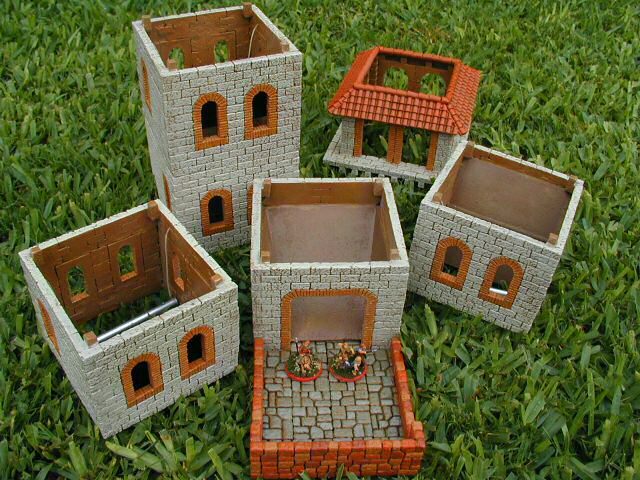 I encourage you to construct your own dice towers. As I explore this hobby, I find I am brimming with many ideas for future dice towers. Perhaps a few electronic solenoids linked to digital recording could make any sort of sound possible: screams, bells, laughter, anything. When attached to a good stereo system, the sound would be awesome. Another idea would be to employ all sorts of gravity powered devices. Perhaps a small external pinwheel that would spin when the dice pushed it. Or perhaps stain glass window vignettes that would rotate as the dice went by. All sorts of Rube Goldberg contraptions are possible with the dice tower. A warning. Despite our love of dice towers, one day in the future, after the decline of western civilization, our dice towers may lay in ruin among the forests of the earth. Take heed and live your life well. And now the lyrics from They Might Be Giants The Bells Are Ringing from their 1996 album Factory Showroom . They travel great distances to the sound. They are persuaded by the music of the bells. They're not responsible for anything they do. The bells are ringing, they hear the sound. They hear the sound (they hear the sound). With arms extended in a trance. They're dropping all businesses at hand. They tilt their heads so they won't miss what it will say. One thousand eyes are staring, they pull away her earplugs. The simple key to happiness. It's only what the people miss. The bells explain what they've been lacking all along. They were disorganized and that was what was wrong. (No) And now they know, (No) The way to go. If you have any comments or questions concerning the dice tower, please email me at the address below. Last modified: Thursday, 09-Jun-2011 12:37:38 MST.